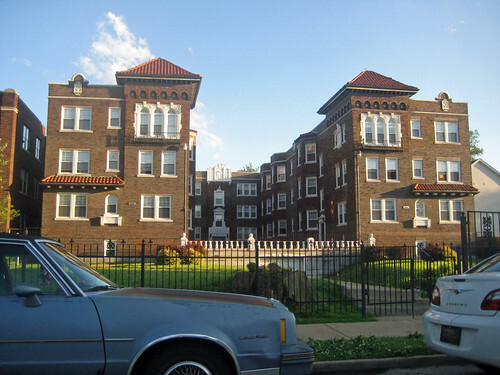 The West End neighborhood began to be developed in the late 1800's as a somewhat pastoral escape for both residents and institutions from the increasingly polluted industrialized areas of the City farther east. 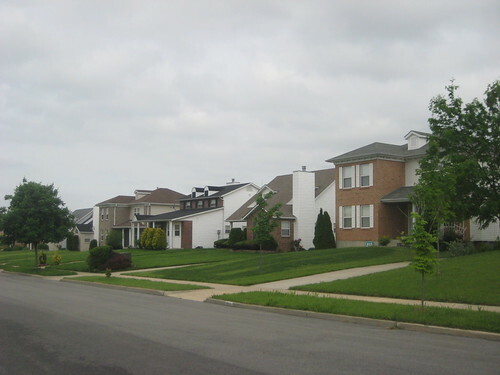 While still urban in plan with a grid of streets, upper middle class residences were built on larger lots and many blocks lacked alleys, with homes instead having individual driveways from the street. 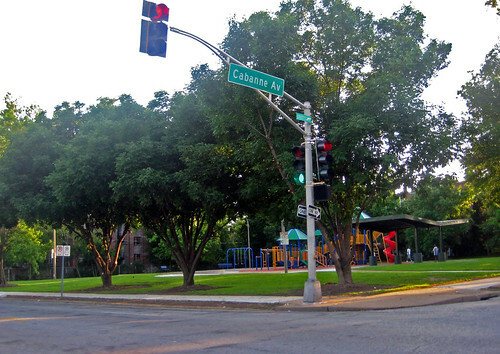 Cabanne Avenue runs the length of the neighborhood from Union to Hodiamont and is representative of the areas ups and downs over the years. One of the institutions that located in the West End was St. Philomena's Technical School, built in 1910 at the corner of Cabanne and Union, having formerly been located at Clark and Ewing in Midtown. The school operated until 1970, after which the building was briefly used as a nursing home and then a day care center before going vacant. 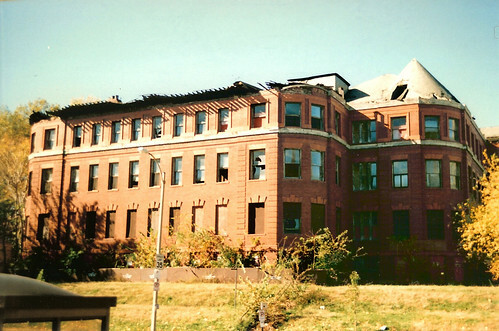 By the early 1990's the building's roof of the east wing collapsed. Unfortunately I only snapped a few photos of this building, always meaning to stop back when I had a full roll of film to shoot. In late 1996 though as I drove north on Union to another destination I sensed something was missing. A glance to my left confirmed that the building was completely gone. The still vacant site is owned by the LRA. Across the street stands this vacant house at 5309 Cabanne. It had been proposed for demolition in August 2006 but the demolition was denied by the Preservation Board. Here is the full board agenda showing photos of a partial collapse of the rear wall. Almost three years, this fragile home is still vacant and in limbo. During the 1920's the large lots which once attracted residents wanting a large home began attracting developers of large apartment buildings. 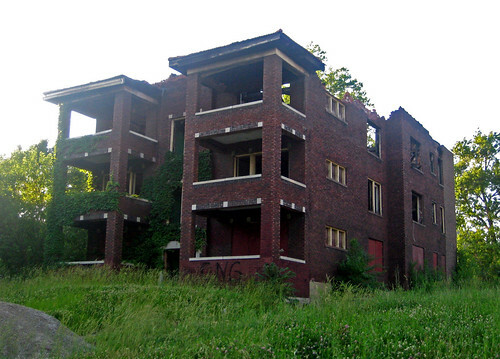 This gave opportunities to middle class St. Louisans to live in a relatively exclusive location. 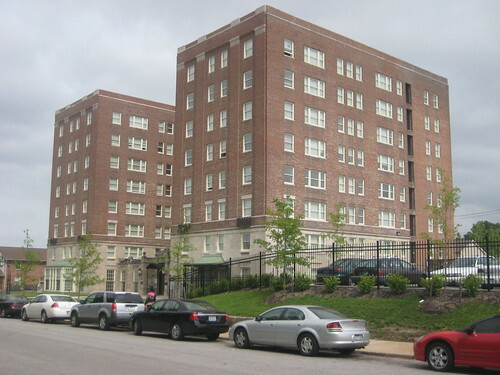 The Winston Churchill Apartments, one of the largest buildings in the neighborhood was built in 1927 at the northwest corner of Cabanne and Belt. The Winston Churchill recently underwent an extensive historic renovation after having become somewhat run down over the years. Across Cabanne from the Winston Churchill was a majestic French Renaissance building whose elevation rivaled City Hall in scale. The Academy of the Visitation was designed by Barnett Haynes & Barnett and opened in 1892. 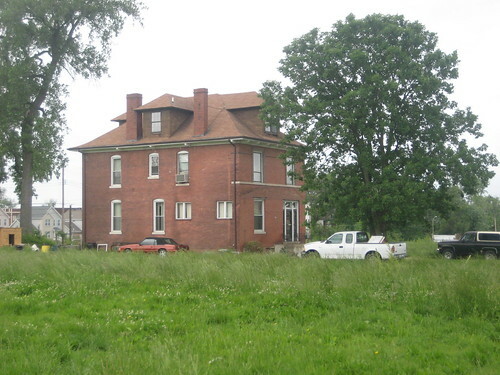 Visitation had moved from the corner of 19th and Cass, just west of the Clemens Mansion. 70 years later in 1962, Visitation again moved west to their present location on Ballas Road near Highway 40. The building was sold for $378,267 to the City of St. Louis, who demolished it and created Visitation Park, now renamed Ivory Perry Park. 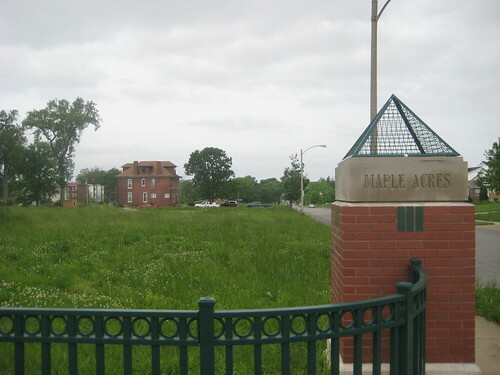 West of Belt on Cabanne, one such development is fittingly called "Maple Acres". 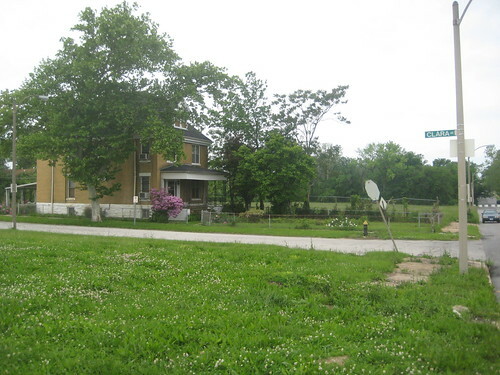 The north side of the street has been built-out with cheap looking suburban styled houses, but the south side of the street is still acres of open prairie except for two surviving original homes. New houses on Cabanne in "Maple Acres"
Further West at Cabanne and Goodfellow this large apartment at 5741 Cabanne building is undergoing a slow and seemingly needless demolition. The building was occupied and seemed to be kept in fairly decent condition. A few years ago there was a fire in the unit that is missing windows in the photo below, but damage did not seem wide-spread. 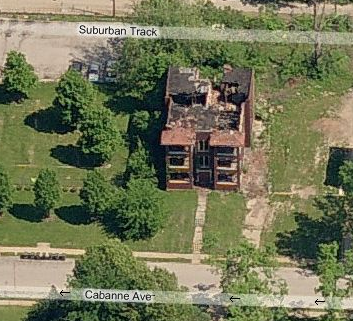 A 2008 aerial photo on Geo St. Louis shows no signs of roof failure that would accelerate deterioration. When the West End was first developed, the area centering on Cabanne Avenue had a relatively unusual concentration (for St. Louis) of frame homes, specifically in the American Shingle Style. Located at the southwest corner of Cabanne and Goodfellow was the Henry S. Potter residence designed by H.H. Richardson and built in 1886. 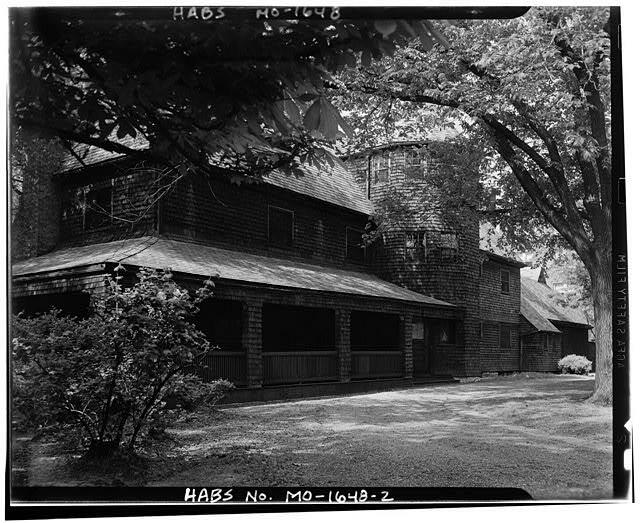 The rambling shingle style home had attached shingled stable and the grounds were surrounded by a decorative wrought iron fence with large shingled posts. 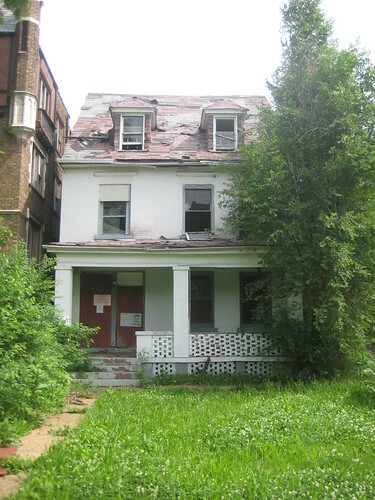 The home like Visitation met its demise when it was sold to the City and demolished for yet another park. 1942 photo from the Historic American Building Survey. Two additional photos here. part of which had survived as of a decade ago is now gone. Just west of the park at 5832 Cabanne is another success story. 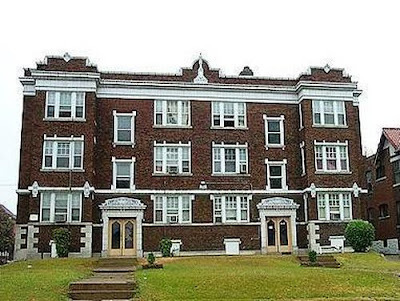 This U-shaped multi-family building appeared vacant for several years and I feared it would meet the fate of so many other apartment houses, but several years ago it was completely renovated and is always immaculately kept. Directly across the street at 5823 however is a six-family building that also had a fire a few years ago. The building is owned by Roberts Housing Investors, Inc. I am not sure if this is any relation to the Roberts Brothers. According to City records, the building has been vacant since at least 1991. 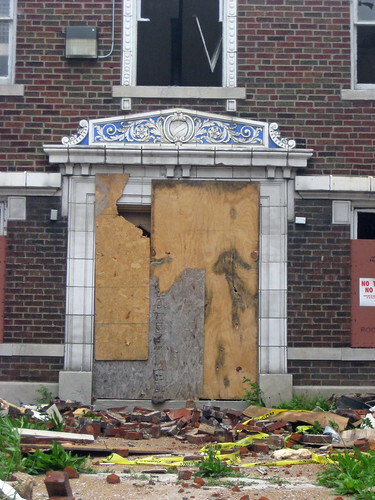 It was condemned for demolition on 6.7.06, but three years later, it still stands. The aerial view below shows the dire condition of the building, which leads me to believe that it will not survive. 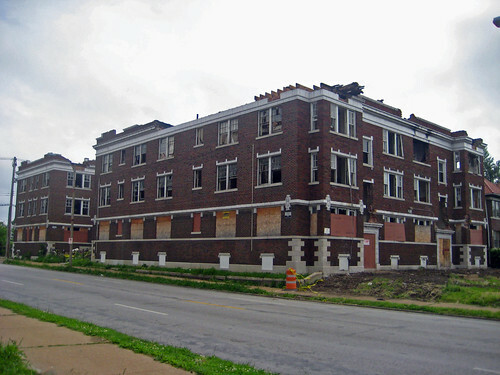 A photo from before the fire can be seen here on Built St. Louis. West of Hamilton, Cabanne Avenue ends with the West Cabanne Place, a private place established in 1888. As one of the farthest reaching platted subdivisions at that time, West Cabanne is purposely toned down compared to the extravagant private streets of the Central West End. The street has several large but unpretentious Shingle Style residences and attracted several architects who built their homes there in this style, which has been called one of the few truly American styles of architecture. The street became a National Register Historic District in 1980, but unfortunately three of the Shingle Style homes have been lost. This restored Victorian located at 5927 West Cabanne place was threatened until 2003 after being vacant for at least 15 years. 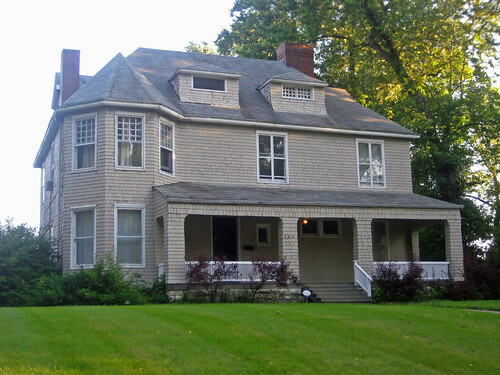 The home was listed on Landmarks 11 Most Endangered list from 1997 until 2002. Renovation began the following year. 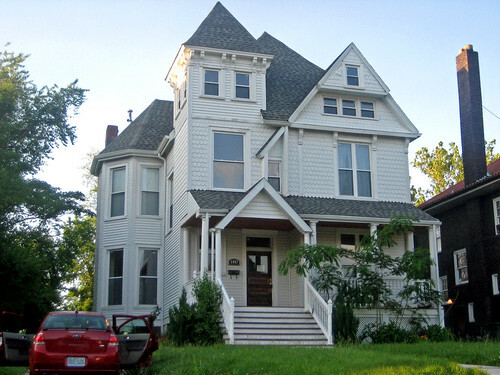 Click here for a "before" photo and history of the home. 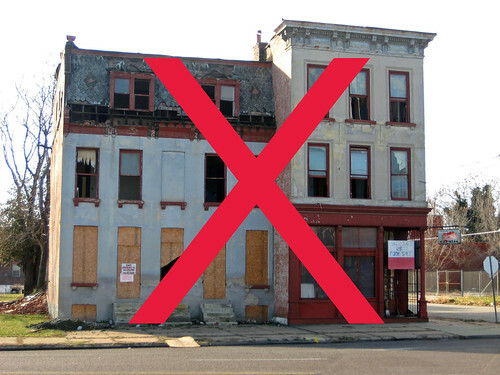 At last weeks closed-door "stakeholder" session about McKee's North City Development Project, Bill Laskowsky of McEagle Development announced that McKee's various shell companies own around 300 building, of which about 60 "Heritage Properties" would be spared from demolition. The remaining 240, 80% of the buildings would presumably be bulldozed for new development. behind the corner had been attacked by brick rustlers. See this earlier post. More photos from a 2007 post at Elology of Absense. With the passage of changes to the Land Assemblage Tax Credit last week at the end of the legislative session, Paul McKee will be able to redeem $20 million in tax credits to recoup costs of property purchases and demolition/land clearance. Very interesting that we now have a tax credit for destroying historic buildings as well as rehabilitating them! you allow this to happen and do nothing to stop it? 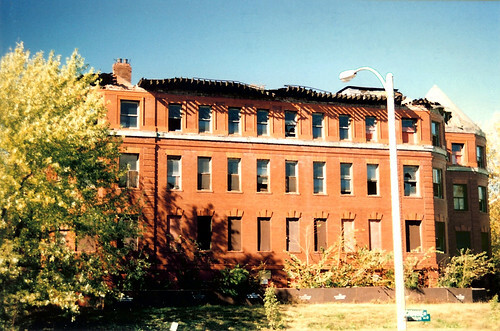 When an individual or developer uses the Historic Tax Credit program (Missouri or Federal) they are held to the Department of Interior Standards for Rehabilitation. What standards will be used to determine what buildings will be considered “Legacy Properties”? What standards will govern what homes and buildings that can be demolished at tax payer expense? Will there be any standards? 1930 St. Louis Avenue owned by McKee's N & G Ventures LC. Will this be considered a "Heritage Property"? Thursday night Paul McKee said: “We are going to attempt to hang on to every historic building can hang on to and save”. Hopefully he will make good on this statement, because it would be complete turn around from his track record to date. 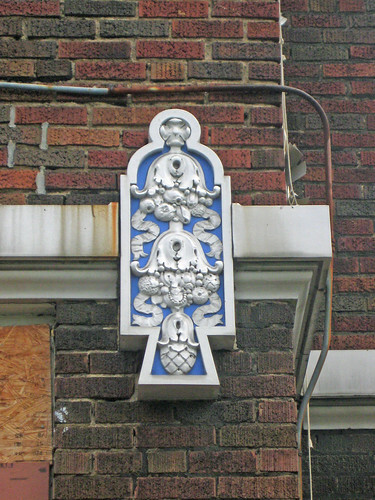 2900 St. Louis Avenue at Glasgow (same intersection as the lost "flatiron"
and Pruitt Store buildings) owned by McKee's Sheridan Place LC. Will this make the "Heritage Properties" list? 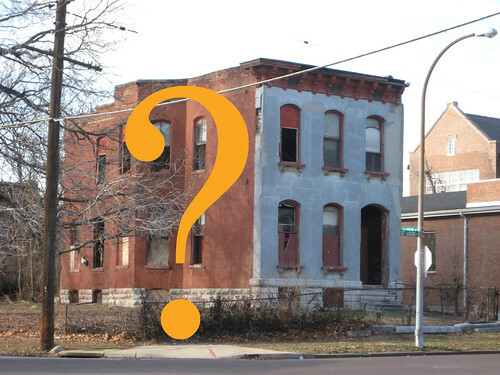 Next week, McKee will be taking his redevelopment plan to the Mayor's office and St. Louis Development Corporation for review. 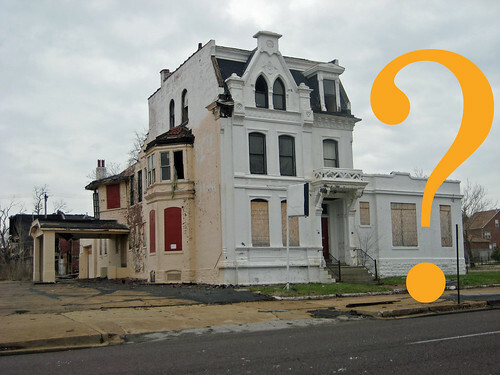 All the talk of job creation, green power, transit loops are great, but some tough questions need to be asked and answered regarding how redevelopment will occur at the neighborhood level. 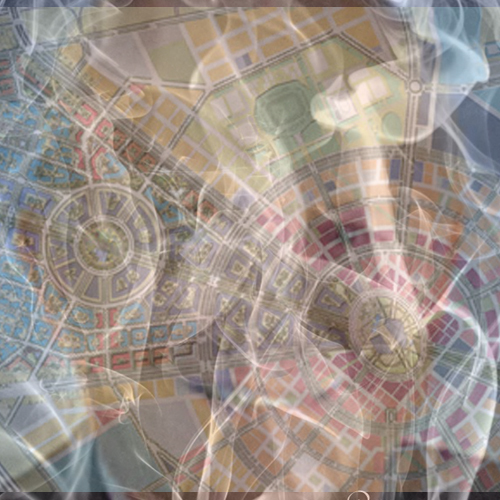 Will the remnants of history that remain be obliterated as they have for the last five years? As taxpayers, we the citizens of St. Louis must be sure that the mistakes of the 1950's and 1960's are not repeated. 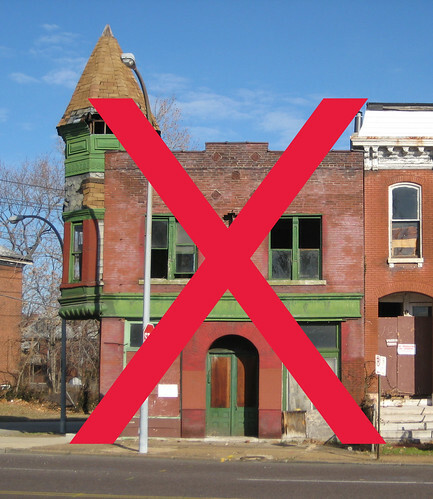 Urban Removal is not the answer for North St. Louis. Tonight's public unveiling of McKee's North St. Louis Development Plan will be held at 7pm at Central Baptist Church Educational Center, 2837 Washington Avenue, not Vashon High School as had previously been announced. The Education Center is located at the northeast corner of Washington & T E Huntley, which is half way between Compton & Jefferson. This last minute venue change seems very short sighted. Two previously held "closed door stakeholder sessions" were held at this same location. I attended the last one on May 11th, and the room was full (I would estimate around 75-100 people), so instead of holding what is supposed to be a larger public meeting in a venue like Vashon's auditorium, which I would estimate seats around 4-500, McEagle has decided to hold the meeting in the same location. At the meeting on the 11th, the room was set up with large tables and chairs. Hopefully the "public engagement coordinator" will have the good sense to set up the room auditorium style which would more than double the capacity (I could see media people alone taking up a third of the room). Real Promise or Smoke & Mirrors? Last night I attended what was apparently the second closed door session for neighborhood stakeholders for what is being called the “North City Development Project”, which most of us have known for several years simply as Blairmont. All media were asked to leave, including Steve Patterson of Urban Review STL. Even Alderman Antonio French of the 21st Ward was asked to leave, but he refused. Paul McKee was a no-show, leaving Bill Laskowsky of McEagle, and Mark Johnson of Civitas, McEagles’ hired master planning firm to present. 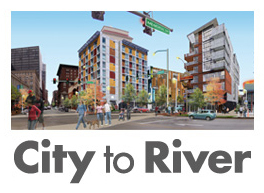 Details were few and they mostly talked about “job creation” and development of four major employment centers: one at a re-configured 22nd Street interchange at Hwy 40, one at the landing of the New River Bridge near Tucker & Cass, one where Jefferson and Parnell split, and one at the Pruitt Iago site. Visions of fixed rail transit, mixed income housing, green power, and sugarplums danced in our heads. A redevelopment ordinance would be introduced to the Board of Alderman on May 27. The said the redevelopment plan would contain mostly financial issues, and that definite plans would evolve over time. Of great interest to me of course is the fate of the many buildings that remains standing within the redevelopment area. Laskowsky announced that they “will retain and reuse every building that can be saved”. These are what the are calling “Legacy Properties”. The question of course is who determines what “can be saved”. 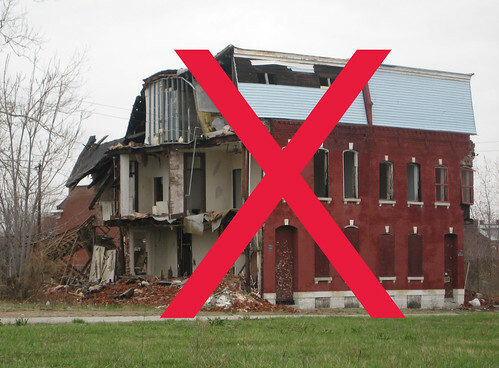 Does this apply to any of the over 200 buildings that have been documented by Rob Powers of Built St. Louis in his Daily Dose of Blairmont series? It obviously does not apply to the many buildings that have already succumbed to arson, brick rustling and what one resident called “criminal neglect”. Laskowsky claimed that the Clemens Mansion would be saved, however the adjoining 1890 chapel would likey be turned into a ruins garden. He blamed previous owners for the current plight of the building, which is partially truthful, however Blairmont associates has done little to stop the rapidly spreading decay in over four years of ownership. He did point out that the crumbling Carr School would actually be re-used as a school for the area. One thing is certain, and that is that area residents are rightly angry and are demanding answers and action. McEagle announced that a large public meeting will be held at Vashon High School on Cass Avenue on May 21st. 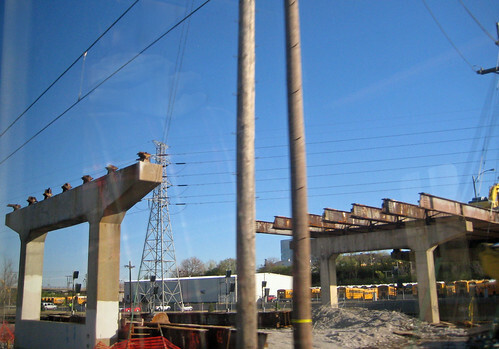 Closed to traffic and partially demolished over a decade ago, the remaining leg of the Spring Avenue Viaduct is currently being demolished, permanently severing a connection across the Mill Creek Valley and rail yards that separate South St. Louis from the Central Corridor. Urban Review did a post about the viaduct in 2007 with a very nice series of photos. Buses will bow in on Public Service Company's Grand Boulevard line Monday after a century of streetcar service. An "owl" streetcar leaving the water tower at the north end of the line at 1:37 a.m. will be Grand's last crosstown trolley. Public Service is switching to busses because of the scheduled demolition and replacement of the Grand Viaduct. The bus line will follow the streetcar route until that work begins in about a month. 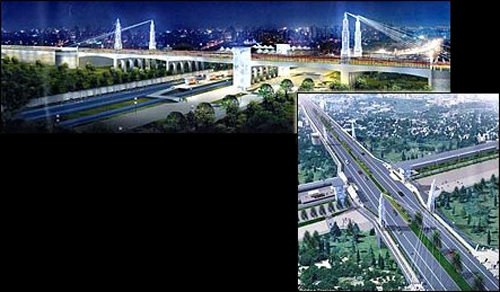 It will then be routed over the new Spring Avenue viaduct. Streetcar service on Grand dates to September 1859, when the Citizens Railway Company extended its line from Fourth and Morgan (now Delmar boulevard) to the Fair Grounds entrance near Grand and Natural Bridge Avenue. The first Grand cars were horse drawn. 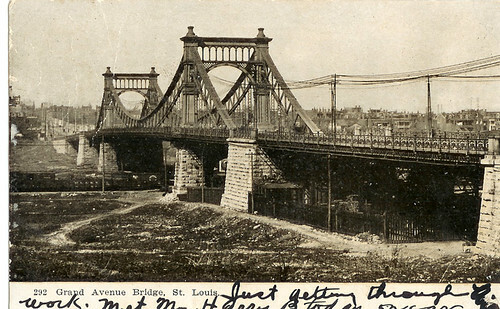 According to transit historian Berl Katz, steam powered cars made their St. Louis debut on Grand in 1865 but the line we back to horses about 1884. Cable came in three years later. Public service has been operating the Grand line since 1927. The shift to busses leaves streetcar operations only on four east-west lines - Delmar, Hodiamont, Wellston and University. 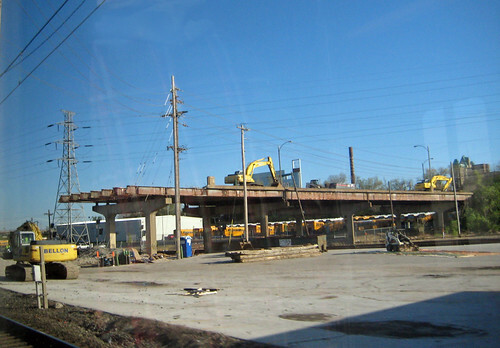 Now almost 50 years later, the Grand Avenue bridge is scheduled for replacement again with a new structure. Grand Avenue will be closed between Chouteau Avenue and highway 40 during construction of the new bridge, but this time the Spring Avenue Viaduct will not be available as a detour route. Compton Avenue, twice the distance away from Grand than Spring, will be the nearest way around the closure. While Grand does not have as much traffic today as in 1960 when the City's population was 750,000, it still has the City's busiest bus line. 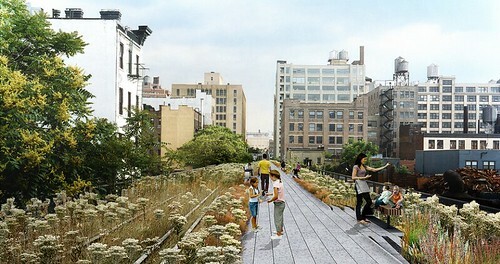 Even if it was not re-opened to auto traffic, the Spring Avenue Viaduct could have been used as a bike path and greenway similar to the Chain of Rocks Bridge or the High Line in New York City, which is scheduled to open later this year. One thing worth noting about the coming re-construction of the Grand Avenue bridge is that the new renderings show the new elevator/stair towers from Grand down to MetroLink as being located north of the tracks instead of directly onto the MetroLink platform as they are currently. Metro's website goes one further and describes the location as also being north of Scott Avenue, which parallels MetroLink. I am not sure why the elevators need to be replaced in the first place, but this change does not make any sense. The majority of people using the stairs and elevators are transferring directly from MetroLink to the Grand Avenue Metro Bus or vice-versa. Now everyone will need to cross both a street and the west-bound MetroLink tracks to get to the platform. An additional question: Will the new Grand Avenue bridge be able to accommodate a future revival of the Grand Avenue streetcar?